The choosen trees to make the poles are preferably spruce. It is also possible to use fir or larch (but fir darkens). The length of a pole is in accordance with the diameter of the teepee. Example : a 20 feets (6,1 m) teepee needs 24 to 26 (7,3 to 7,9 m) feets poles. The top knot will be done at 20 feets high. There, the poles must have 1,5 inch (4 cm) to 2,5 inches (6 cm) of diameter. It is not good to treat the poles with linseed oil or to varnish them because these products speed up fire but it is possible to paint them with latex paint (water paint). It is advisable to cut the poles at spring when the sap is ascending because it is then easier to take off the bark. It is important to take off all the wood knots because each can make hole in the teepee's fabric. 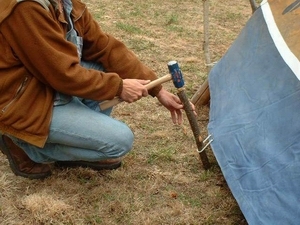 Moreover, a knot can stop water descending along the pole, so the water falls in the teepee. To dry the poles, it is important to place them as air can go between them and to turn them regularly so they will not twist. With a dry weather, it will take 2 to 3 weeks to dry the poles before to use them. It is important to verify the poles every year because the wood, when it dries, shrinks and some knots can come out. It is advisable to take young bushes to make the pegs, about 3 feets (1 m) long and 2 inches (5 cm) diameter. This pegs length prevents that the ties that bind the teepee to ground unfasten when great winds are blowing.